If you are registering or joining a webinar and haven’t received an email confirmation that’s specifically for a panelist or alternative host, you are an attendee in the webinar. As an attendee, you can mute/unmute your audio, virtually raise your hand, and send messages others. Note: Some attendee controls won’t be available if disabled by the host. If you have additional controls not shown here, you may be a co-host or panelist in a webinar or an attendee in a meeting. Read more about attendee controls in a meeting. Open the Zoom Client and click Join a Meeting. In the Meeting ID / Personal ID / Personal Link field, enter the 9-digit webinar ID, and click Join. If you receive a message showing the date and time of the webinar, check the the date and start time of the webinar including the timezone. Make sure to join when the webinar starts. Click the dropdowns to change the audio devices or adjust the sliders to change the volume. Your audio settings will now change to a Mute/Unmute button. Note: You can still access the audio settings by click on the ^ arrow next to the Unmute/Mute button. 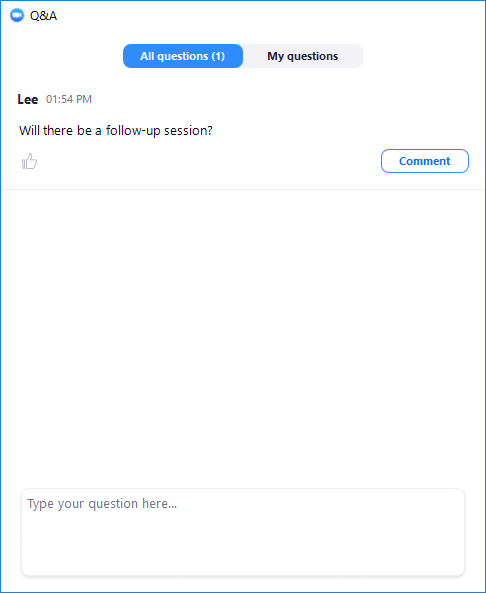 Click Q&A to open the Q&A window. Type your question into the Q&A box. Click Send. 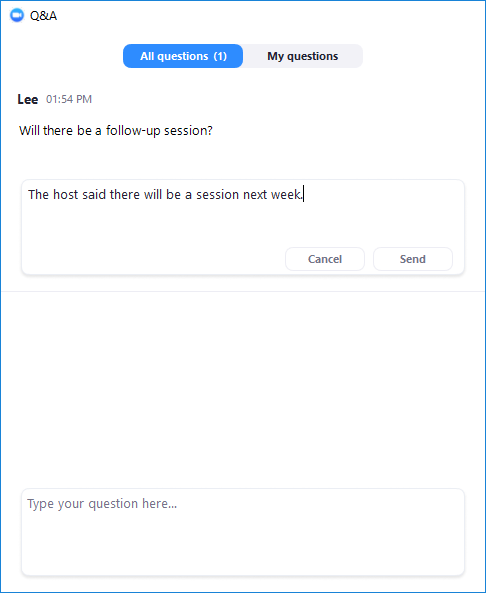 If the host replies via the Q&A, you will see a reply in the Q&A window. As an attendee you can also like or comment on other attendee’s questions. This helps the host or participant identify popular questions, especially in a webinar with many attendees. Click the thumbs up icon to like a comment. 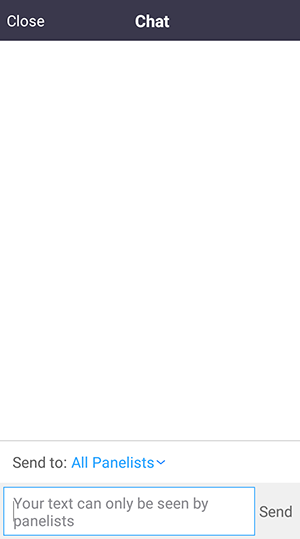 Tip: The number beside the icon is the total number of likes the question has received so far. Click the red thumbs up icon to unlike a comment. Click Comment to write a reply to an existing question. Your comment will appear beneath the question. The chat will appear on the right side of your Zoom window if you are not in full screen. If you are in full screen, it will appear in a window that you can move around your screen as needed. 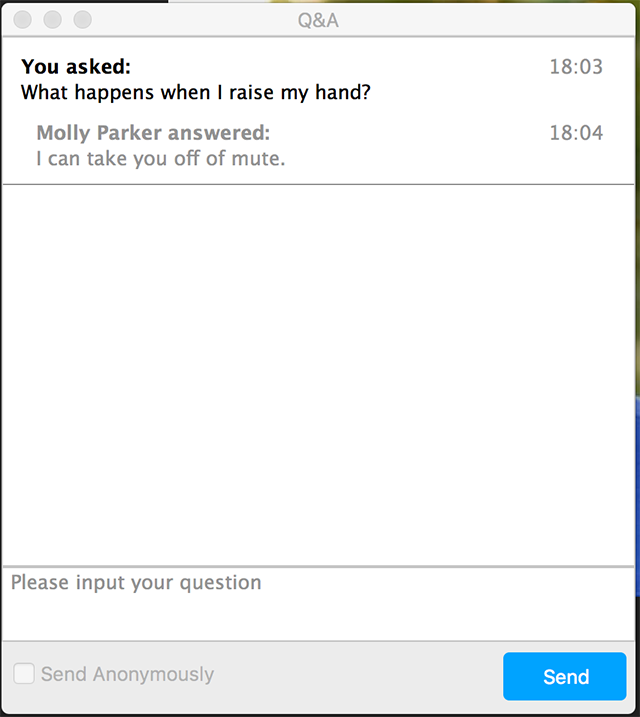 To change who you are chatting with, click the drop down beside To:. You can raise your hand in the webinar to indicate that you need something from the host. The host may instruct you on how they plan to use this. 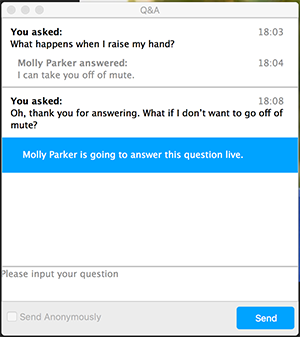 Many webinar hosts use this feature to know if an attendee has a question and would like to speak out loud. Read more about raising your hand. To adjust your audio settings in the webinar, click ^ next to Mute / Unmute. Click Test speaker and microphone to open the full audio settings. 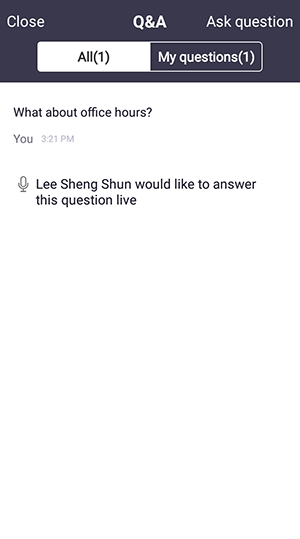 The chat will appear in a window that you can move around your screen as needed. Open the Zoom app and tap Join a Meeting. 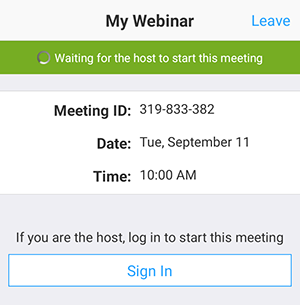 In the Meeting ID field, enter the 9-digit webinar ID and tap Join Meeting. Enter your name and email address if requested. Tap OK. 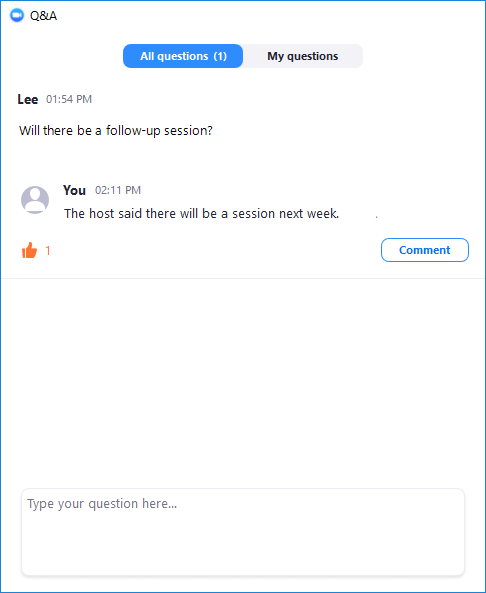 If the host hasn’t started broadcasting the webinar or is preparing using a practice session, you’ll see the following message. The webinar will start when the host starts broadcasting. Tap the speaker icon at the top-left corner to turn off your device’s speaker. If the host allows you to talk, you will receive a notification. Tap Unmute myself. Tap Audio if you want to mute yourself. Tap Q&A to open the Q&A window. Type your question into the Q&A box. Tap Send. Tap Chat to open the in-meeting chat. To change who you are chatting with, tap the dropdown beside Send to. Tap Raise Hand in the attendee controls. Your hand will stay raised until you or the host lowers it. You can lower your hand if needed by clicking Lower Hand.